Jim Willie: “We’re in the End Game Now”!! Derivatives have been hidden in plain site. Jim believes there are potentially 100s of Billions of dollars a month in derivative monetization, going on for years now. US debt ceiling raise indicates a default, potentially with the involvement of China, which now owns a nice chunk of Manhattan, including a steak in the US Federal Reserve. From US Treasury prop ups, QE, Interest rate swaps, to the bond carry trade, Jim covers a host of topics of manipulation. Jim breaks down exactly how long term treasury demand is created and free money just scraped off the back end. Not only can they scam the populace with false perceived demand but they also make huge risk free profits. Student loans and car loans are the new sub prime markets. The Saudi Real has plummeted. Things are getting shaky. We are marching towards systemic failure. It won’t be a bank failure. The bank system cannot fail. Contagion has been prevented from massive cash injection. Sovereign debt seniority laws were literally changed. The level of fraud is overwhelming. Tens if not hundreds of trillions of dollars have been squandered. Gold is the nemesis. It can only sustain so much paper mache. There is a breaking point. Eventually physical metal breaks the game. Once the Western gold is drained China can pull the plug. Enter the Shanghai gold exchange. The end game is near and it all pertains to physical gold (& silver). The jig is up, but nobody wants to be the fall guy. China could double the gold price and collapse the US without an obvious intervention- like forcing a few US banks into insolvency and causing contagion. The Saudis are engaged in a price war with respect to their fellow OPEC members. What does Saudi Arabia stand to benefit by lowering its oil price? Jim breaks down multiple potential scenarios. Is it to do China’s bidding? Was it to render harm to Russia? Or support the USD with a short term lift? Perhaps they’re just pissed from their gold being stolen. Perhaps to break up the OPEC cartel and abandon the petro dollar without being the fall guy? Wanting a legitimate monetary system over fraud and war is not unpatriotic. It is what our country was founded upon. “We are a raped and pillaged nation exploited and colonized with hidden control strings and deep cables. The only way to get out of it is to go back to a gold standard.” Russia and the East are working on energy pipelines, while we in the west are working on pipelines of toxic money, fiat paper, and liquidity networks. We choose honesty over war. October 25, 2014 Posted by mosesman | Economics, GeoPolitics, Social Trends	| Bankruptcy, BRICS, China, Collapse, corruption, Crime, Currency, derivative, Europe, Eurozone, Fascism, FederalReserve, Fraud, Gold, GreatDepression, Hyper-inflation, Illuminati, Meltdown, Middle_East, NATO, New_World_Order, oil, propaganda, Psyop, Russia, Saudi_Arabia, Silver, Syria, Treasury, US, War | Comments Off on Jim Willie: “We’re in the End Game Now”!! Gold tsunami wave is coming! The pattern of central bank covering the debt is clear. The lesson is that central banks can apply paper patches to the failed banks, and buy more time, then repeat the process on the next failed bank event. No limit to their bank patches seems to be in force. The banker cabal can continue endlessly since their patches are based on paper solutions, fiat paper money spew, and they control the paper output. They are the masters of the House of Paper. The paper mache solutions can continue in a seemingly endless manner, but not in the Gold market. The intervention and suppression in the Gold market is finite. It requires Gold bullion, the physical ingot bars, in order to execute the perpetuated interference and alteration to this financial niche market. The manipulation is finite, and it is coming to an end. When the Shanghai shock comes, all the Paper Gold structures will fall, all the FOREX derivatives will collapse, all the control rooms will go into panic mode. The Quantitative Easing initiatives have been declared as stimulus and successful in sustaining the US financial system. While having been able to continue the debt floats, the many market props, providing coverage for USGovt debt securities and mortgage backed securities which nobody wants, the initiative is hardly stimulus. The hyper monetary inflation does what we always learned it did, as in from school for 50 years, dole out its powerful corrosive effect. The inflation lifts the cost structure, leads to elimination of profit margins, and forces businesses to shut down, thus taking equipment out of service. The Jackass prefers to call the QE effect as killing capital, forcing retired capital, putting equipment on mothballs, often liquidated. Neither the USFed nor the Wall Street partners ever refer to the capital destruction effect, because it contradicts their stimulus argument and false message. Theirs is pure propaganda in keeping with the urgent directive to save the banks that are too big to fail. These are the financial crime centers of America. October 25, 2014 Posted by mosesman | Economics, GeoPolitics	| Bankruptcy, China, Collapse, Crime, Currency, Eurozone, Fascism, FederalReserve, Fraud, Gold, GreatDepression, Hyper-inflation, Illuminati, Meltdown, Middle_East, New_World_Order, propaganda, Russia, Silver, Treasury, US, War | Comments Off on Jim Willie: Shanghai Shock to Shatter the Gold Market! The doctor had a 103 degree fever when he checked into a hospital. New York officials are scrambling to identify potentially hundreds of individuals he may have come into contact with. According to The New York Times, the doctor took a subway train from New York to Brooklyn, where he joined others at a bowling alley for the evening. He then took a taxi back to his home in New York. Obama: Ebola is a “Trial Run” For a Deadlier Airborne Disease! During remarks made after a White House meeting with the administration’s Ebola Response Coordinator Ron Klain, Obama tried to reassure the public that the U.S. health infrastructure was prepared to deal with additional cases of Ebola. However, the President raised some eyebrows when he suggested that the current outbreak could merely be a precursor to a more deadly epidemic. “If there is a silver lining in all the attention that the Ebola situation has received over the last several weeks, it’s a reminder of how important our public health systems are, and in many ways what this has done is elevated that importance,” said Obama. “There may come a time sometime in the future where we are dealing with an airborne disease that is much easier to catch and is deadlyand in some ways this has created a trial run for federal, state and public health officials and health care providers as well as the American people to understand the nature of that and why it’s so important that we’re continually building out our public health systems but we’re also practicing them and keeping them in tip top shape and investing in them,” added Obama (emphasis mine). Obama’s suggestion that the current Ebola outbreak may merely be a means of helping health authorities prepare for a much deadlier outbreak of an airborne virus is likely to pique the interest of those who have expressed concerns about the CDC’s measures for dealing with an outbreak of a communicable disease, which allow for the quarantine of “well persons” who “do not show symptoms” of the disease. – Quote 17:30 onwards, “V” the Guerrilla Economist reporting what a 4 star US Air Force General said about plans of the Illuminati! October 25, 2014 Posted by mosesman | GeoPolitics, Medicine & Health	| Crime, depopulation, genocide, Illuminati, New_World_Order, Obama, Pandemic, Terrorism, US, War | Comments Off on Obama: Ebola is a “Trial Run” For a Deadlier Airborne Disease! Bio-Weapons Expert Professor Francis A. Boyle: Ebola Outbreak Is A Bio Weapon Release! October 25, 2014 Posted by mosesman | GeoPolitics, Medicine & Health	| Africa, Crime, depopulation, genocide, Illuminati, MIC, New_World_Order, Pandemic, Terrorism, US, War | Comments Off on Bio-Weapons Expert Professor Francis A. Boyle: Ebola Outbreak Is A Bio Weapon Release! BREAKING: Mandatory Quarantine Facilities Activated in New York! New York and New Jersey will supersede guidelines set by federal government. First healthcare worker already isolated. October 25, 2014 Posted by mosesman | GeoPolitics, Medicine & Health, Social Trends	| corruption, Crime, depopulation, genocide, Illuminati, Martial_Law, New_World_Order, Pandemic, Police_State, Terrorism, US | Comments Off on BREAKING: Mandatory Quarantine Facilities Activated in New York! Gov’t Is Working Together With The U.N To Deceive The Public! Alex Jones discusses the latest news including how a doctor in NYC is now confirmed to have Ebola and how he recklessly endangered others. October 25, 2014 Posted by mosesman | GeoPolitics, Medicine & Health, Social Trends	| corruption, Crime, depopulation, Fraud, genocide, Illuminati, New_World_Order, Pandemic, propaganda, Psyop, Satan, Terrorism, UN, US, War | Comments Off on Gov’t Is Working Together With The U.N To Deceive The Public! Putin Warns Of Risk Of Major Conflict, Says Dollar Losing Reserve Currency Status! October 25, 2014 Posted by mosesman | Economics, GeoPolitics	| Bankruptcy, Collapse, Crime, Currency, FederalReserve, Fraud, GreatDepression, Illuminati, Meltdown, Middle_East, New_World_Order, Russia, Treasury, Unrest, US, War | Comments Off on Putin Warns Of Risk Of Major Conflict, Says Dollar Losing Reserve Currency Status! BOOM! Marysville Police Planned SWAT Drill at School Day Before Shooting! HERE IT IS, SMOKING GUN PROOF THAT THEY HAD A DRILL UNDERWAY IN MARYSVILLE! Reports off the Live feed have confirmed that the suspect is dead. Officers reported finding the body inside Marysvill-Pilchuck High School! October 25, 2014 Posted by mosesman | GeoPolitics, Social Trends	| Crime, Fraud, genocide, Illuminati, New_World_Order, propaganda, Psyop, Terrorism, US | Comments Off on BOOM! 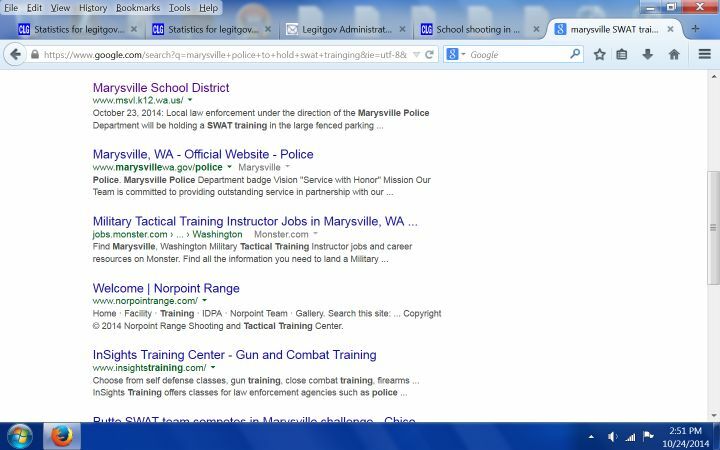 Marysville Police Planned SWAT Drill at School Day Before Shooting! Weird “Emergency Alert” Interrupts TV Viewers Across America! October 25, 2014 Posted by mosesman | Social Trends	| MSM, propaganda, US | Comments Off on Weird “Emergency Alert” Interrupts TV Viewers Across America! Climate Change PROVED to be ‘Nothing But a Lie’, Claims Top Meteorologist ! Climate change PROVED to be ‘nothing but a lie’, claims top meteorologist! John Coleman, who co-founded the Weather Channel, shocked academics by insisting the theory of man-made climate change was no longer scientifically credible. Instead, what ‘little evidence’ there is for rising global temperatures points to a ‘natural phenomenon’ within a developing eco-system. Mr Coleman said he based many of his views on the findings of the NIPCC, a non-governmental international body of scientists aimed at offering an ‘independent second opinion of the evidence reviewed by the IPCC.’He added: “There is no significant man-made global warming at this time, there has been none in the past and there is no reason to fear any in the future. October 25, 2014 Posted by mosesman | GeoPolitics, Science & Technology, Social Trends	| corruption, Crime, Fraud, Global_Warming, Illuminati, MSM, New_World_Order, propaganda, Psyop, US, weather | Comments Off on Climate Change PROVED to be ‘Nothing But a Lie’, Claims Top Meteorologist ! Was Ebola Accidentally Released from a Bioweapons Lab In West Africa? Accidental release or deliberate release? You decide! California Orders Churches To Fund Abortions — Or Else! California Orders Churches To Fund Abortions—Or Else! October 25, 2014 Posted by mosesman | GeoPolitics, Medicine & Health, Social Trends	| corruption, Crime, Illuminati, New_World_Order, US | Comments Off on California Orders Churches To Fund Abortions — Or Else! Dollar Losing Reserve Currency Status, Central Bankers Preparing A Major Conflict! UK growth falls .7%. Frances unemployment is at an all time high. Unilever sales down because of economy. U.S. Government revises house data to make it look like housing is in a recovery.China launches the BRICS bank. Shooting in Washington state to push gun bills. Mali has first case of Ebola as China signs economic deal with Mali. Yatzenyuk worried about terrorist attacks by Russia during elections.Kicked out puppet government tells citizens to cause civil disobedience. U.S. destroying the infrastructure of Syria, now considering bombing oil pipelines. Putin warning central bankers getting ready to push forward a major conflict. Click on image for pdf E-book! October 25, 2014 Posted by mosesman | Economics, GeoPolitics, Social Trends	| Bankruptcy, BRICS, China, Collapse, Crime, Currency, Eurozone, Fascism, FederalReserve, France, Fraud, genocide, Gold, GreatDepression, Hyper-inflation, Illuminati, Mali, Meltdown, Middle_East, New_World_Order, Pandemic, propaganda, Psyop, Russia, Syria, Terrorism, Treasury, UK, Unrest, US, War | Comments Off on Dollar Losing Reserve Currency Status, Central Bankers Preparing A Major Conflict! Israel Mulling Construction of 1600 Illegal New Units in Al-Quds, Jerusalem! The Jerusalem Committee for Planning and Construction is to discuss constructing the settler units in the Hareidi neighborhood. The new plan comes despite widespread global condemnation of Israel’s land grab policies. Under international law, settlement construction on the occupied Palestinian territories is illegal. Also, the US-led talks between Israel and the Palestinian authority have been stalled over the issue. October 25, 2014 Posted by mosesman | GeoPolitics, Social Trends	| Apartheid, Crime, ethnic_cleansing, Gaza, genocide, Israel, Nazi, Palestine, Satan, Terrorism, UN, Zionism | Comments Off on Israel Mulling Construction of 1600 Illegal New Units in Al-Quds, Jerusalem!